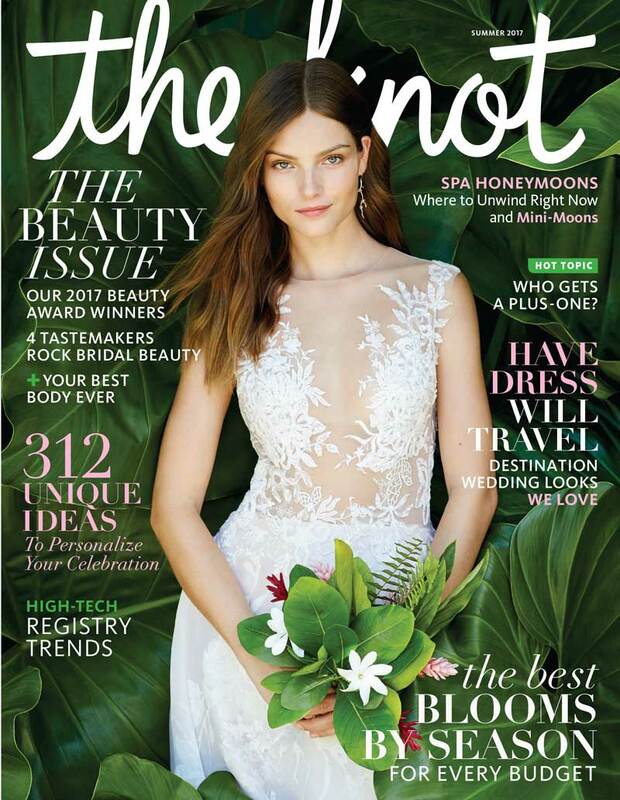 We were featured in the Fall 2018 issue of The Knot for our work on Sarah and Euripides’ wedding! 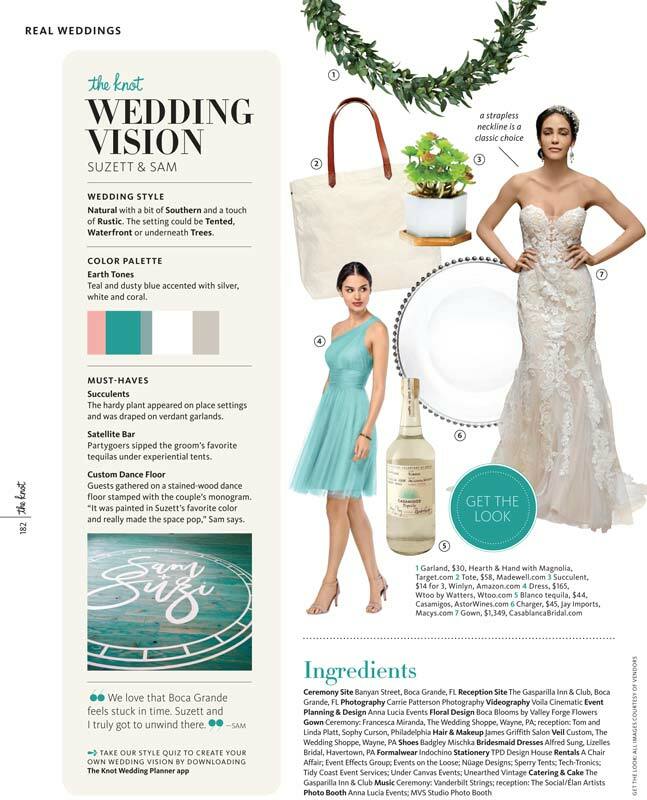 We were featured in the summer 2018 issue of The Knot for our work on Suzett and Sam’s island wedding! 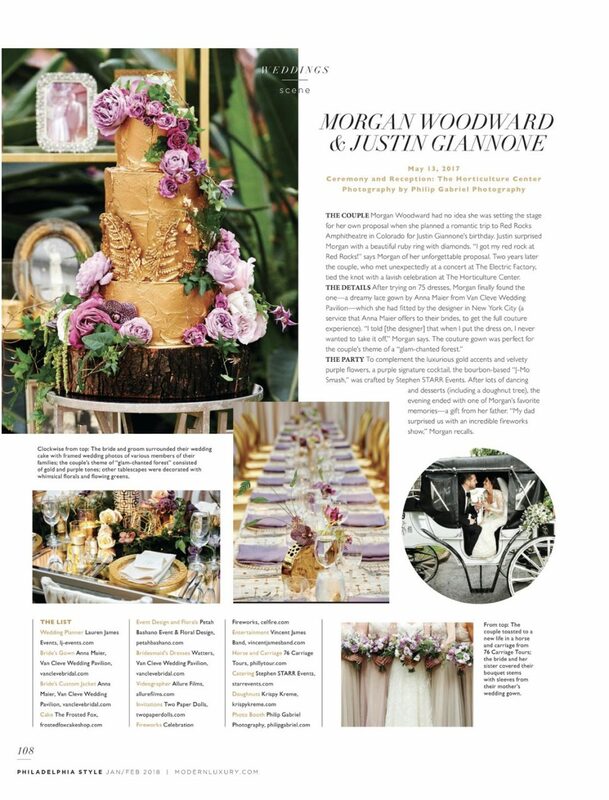 We were featured in the January/February 2018 issue of Philadelphia Style for our work on Morgan and Justin’s wedding. 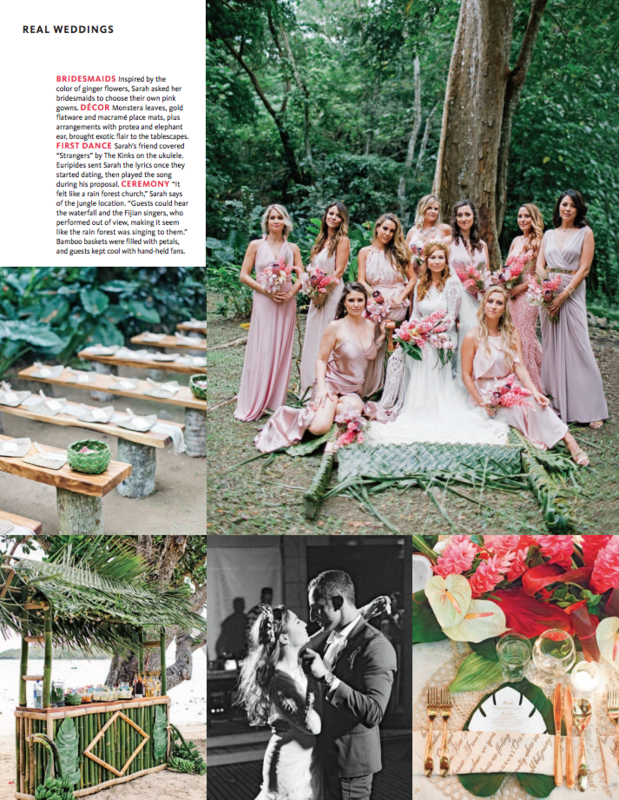 We were featured on the Harper’s Bazaar website for our work on Amirah and Ross’s wedding in Punta Mita, Mexico. 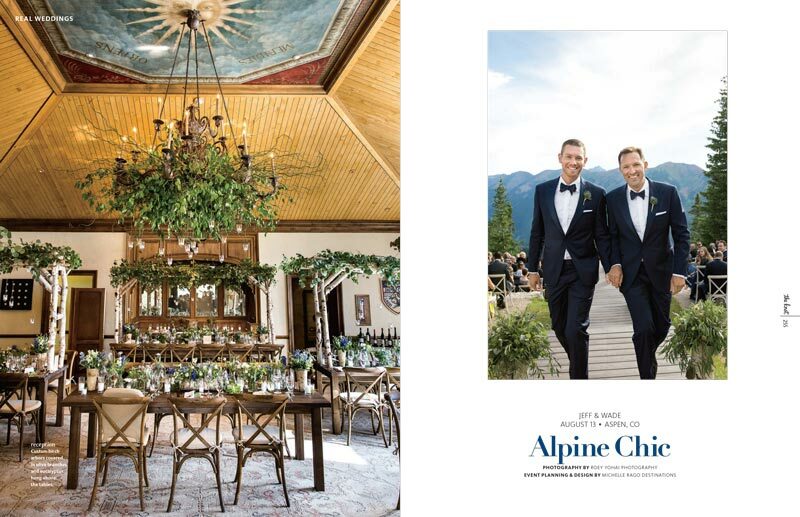 We were featured in The Knot’s Summer 2017 issue for our work on Jeff & Wade’s wedding in Aspen, Colorado. 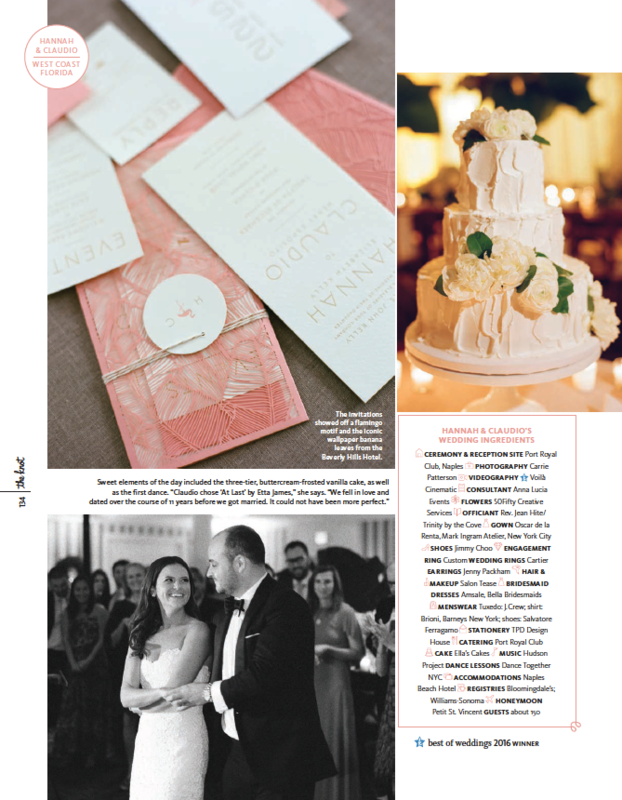 Featured as Hannah and Claudio’s stationery provider! Vanessa Kreckel and Lauren Martin go back—way back, to the 1980s, when both were growing up in eastern Pennsylvania. As grade-schoolers and throughout high school, they played field hockey and softball together. If you ask Vanessa, who is two years older, she’d say she was the cooler of the two. Lauren remembers it differently: “I thought she was annoying; I hung out with her best friend’s younger sister.” In 1993, Vanessa went off to college and the two didn’t cross paths again until 2008, when the magic of Facebook rendered them “friends.” Lauren was now a physical-education teacher living in New York’s Hudson Valley, and Vanessa owned a graphic-design and letterpress firm, Two Paperdolls, in Philadelphia. 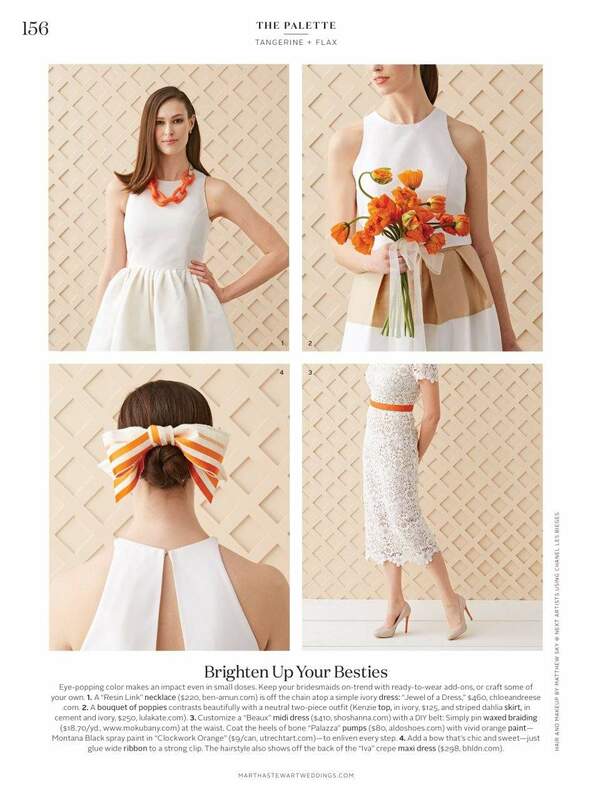 “The best day ever was when she invited me to ‘like’ the Two Paperdolls Facebook page,” says Lauren. This shower crafted by Twenty Three Layers along with florals by Van Vliet & Trap should get the best ever brunch award and it has everything to do with the dessert spread. Donuts, artisan marshmallows AND gem shaped cookies are only the beginning. Try adding a savory farm-to-table breakfast, like 3 billion choices of drink bars and a sea of pretty color captured by Kathleen O’Donnell. It’s proving that being surrounded by pastel is the best way to brunch. A mimosa bar helps too. Winston and Elizabeth first met the first day of freshman year at Vassar- they lived four doors down from each other in their freshman dorm! 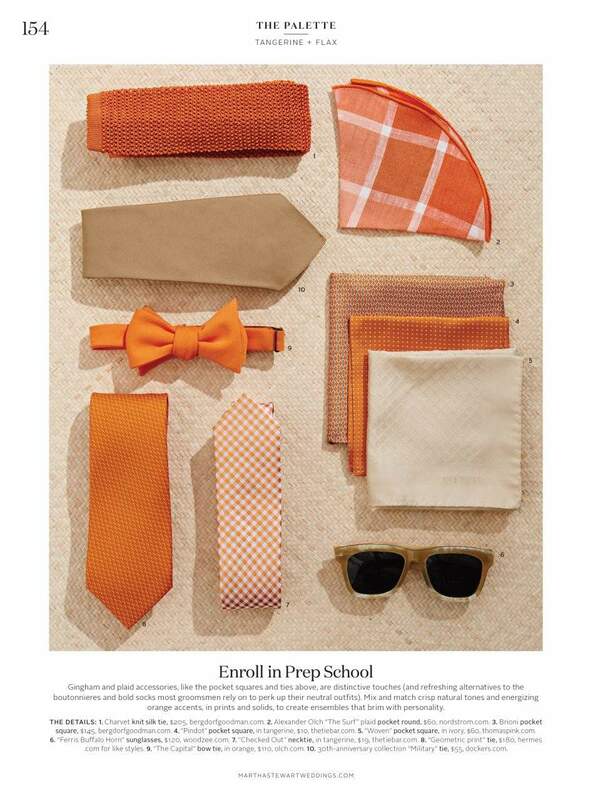 They honestly were never actually friends at Vassar, just acquaintances with many mutual friends in common. College went by, Elizabeth went to school in Chicago, Winston worked in NYC. 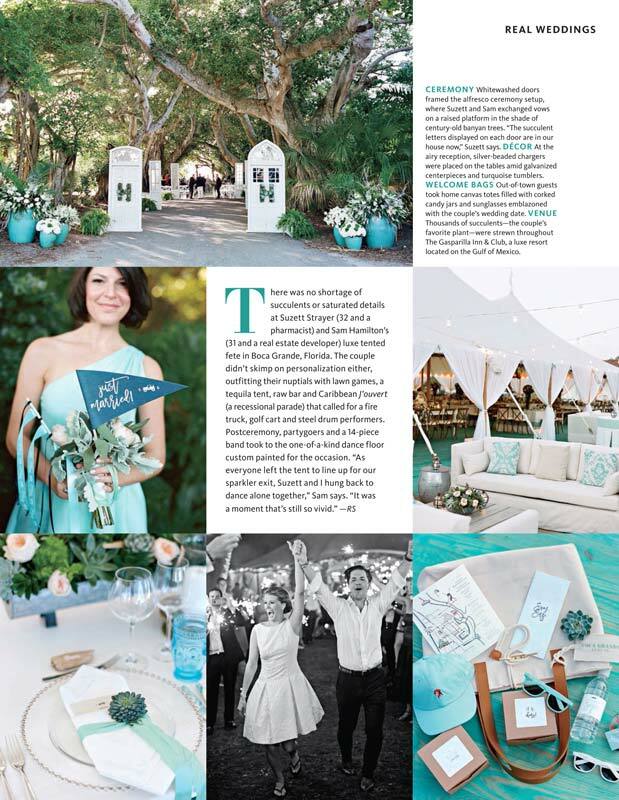 Fast forward to July four years after college graduation, and they re-met at their mutual friends Emily and Scott’s wedding. 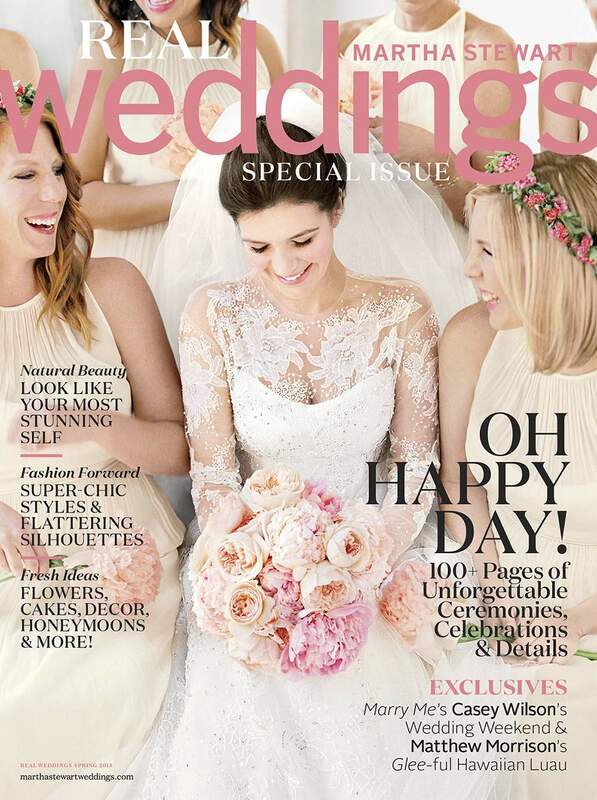 (Emily, was Elizabeth’s maid of honor!). Winston had just finished his first year of grad school at Penn and Elizabeth had just moved to Philly a few weeks earlier to start residency. They exchanged some platitudes about hanging out some time. About a month later Elizabeth invited Winston over for dinner. He brought over a bottle of wine , and dinner turned into a 5-hour, 2-bottle of wine night. He kissed her cheek when he left for the evening , which was when Elizabeth first realized that this may have actually been our first date. The rest is history! We’re fresh off the heels of another amazing Engage Summit, bursting with inspiration like you wouldn’t believe. And while spending a few days surrounded by top-notch vendors is a treat in and of itself, it’s the amazing moments (like a surprise trip to Disney World!) that leave us feeling entirely spoiled. 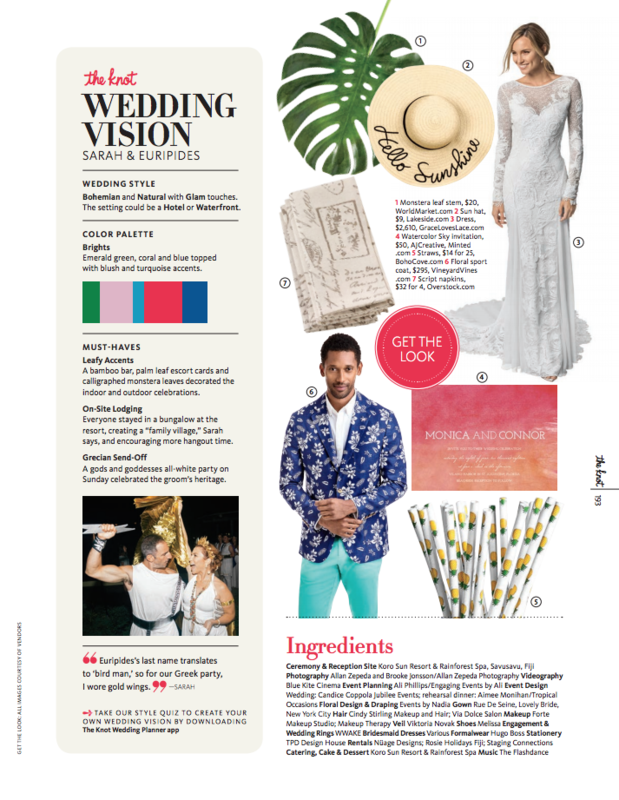 So today we’re sharing a peek at the goodies we got, the industry pros we met, and the parties we attended to inspire your own special day. Twice a year, every year, the creme de la creme of the wedding industry comes together to talk shop, to inspire, to trade war stories and to be spoiled utterly rotten by the amazing duo at Engage Summits – the lovely Rebecca Grinnals and Kathryn Arce. 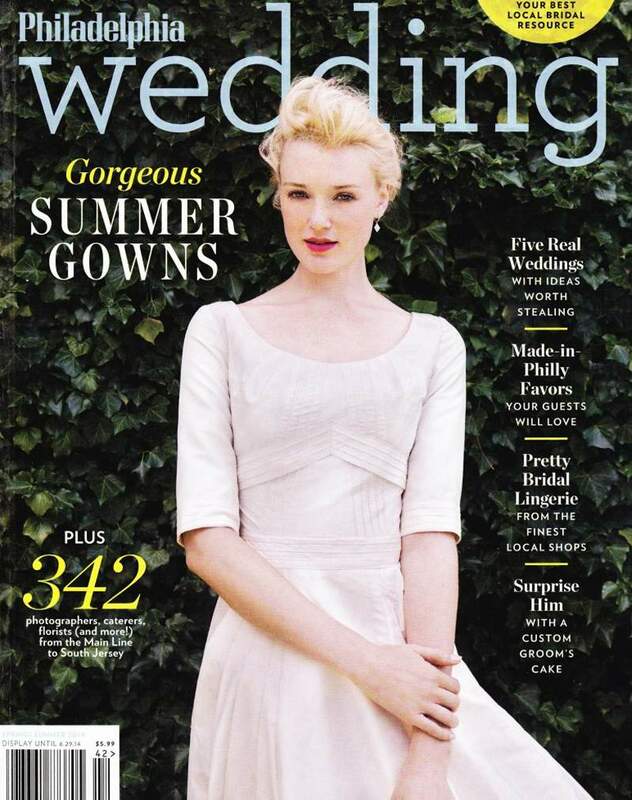 It’s four days of pure wedding bliss. And while I’d love to spill every last detail, I’m focusing instead on the one event that every last one of YOU will find inspiring. Crafted and executed by the incredible team at Elena Damy, this is a Mexican fiesta worthy of Kings. And if ever you get the chance to attend one of the upcoming Summits, consider yourself one of the family. Oh and there may or may not have been an appearance by Salt-N-Pepa thanks to Elan Artists. More here! Every wedding has that gorgeous moment that really defines it. Well, this wedding has like a hundred of those gorgeous moments. From that ridiculously inspiring backdrop, to the perfect florals from Petals Lane and every detail in between planned by Laurel & Elm, this Michener Art Museum soiree captured by Tina Jay Photography couldn’t be more perfect if it tried. See more here. 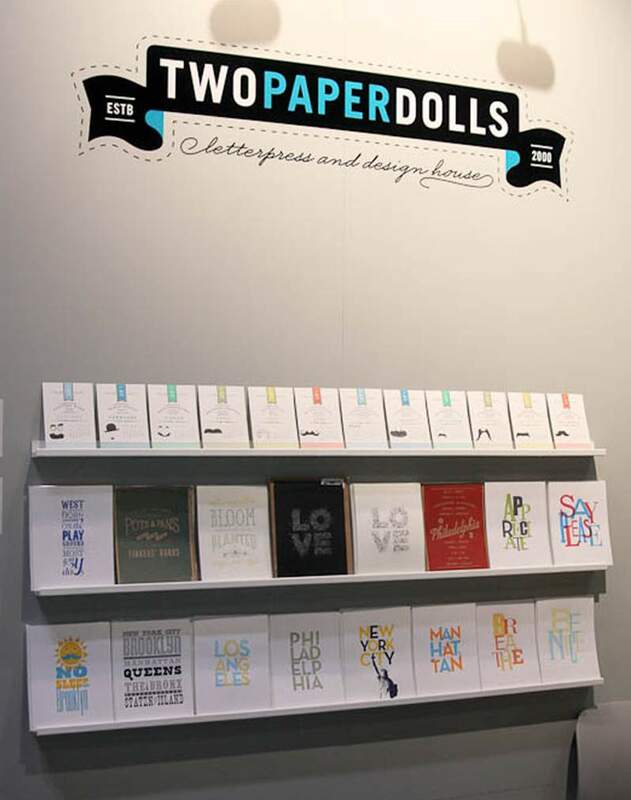 We’re big fans of Two Paperdolls‘ gorgeous letterpress invitations (you can check them out in our local invitation guide), so you can imagine our excitement when we caught wind of the news that they moved their Wayne studio to a new, larger location and opened up a darling retail shop inside the space, too. 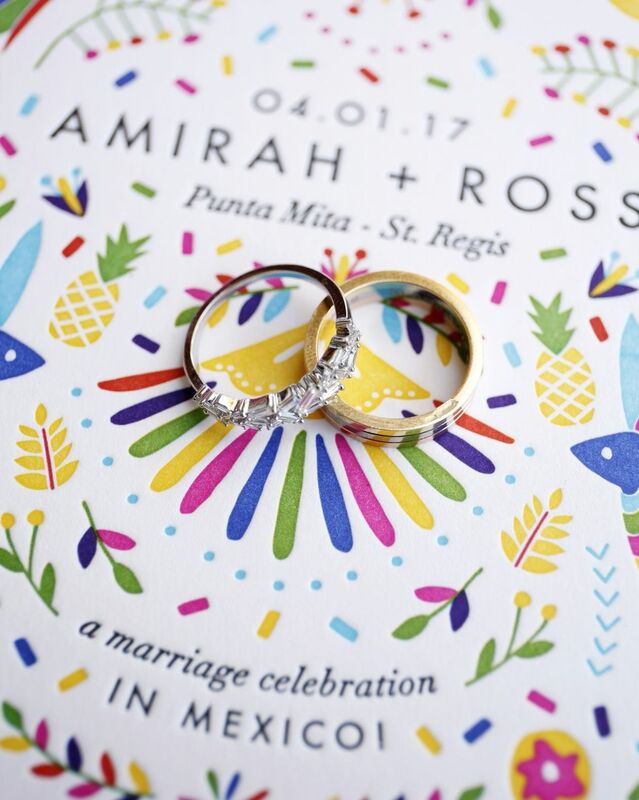 Now, not only can you head to their new studio to chat with owner Vanessa Kreckel and her talented team about designing your custom wedding invitations—their massive design house is bright and colorful with a modern, industrial feel—but you can also get a bit of shopping done there as well. 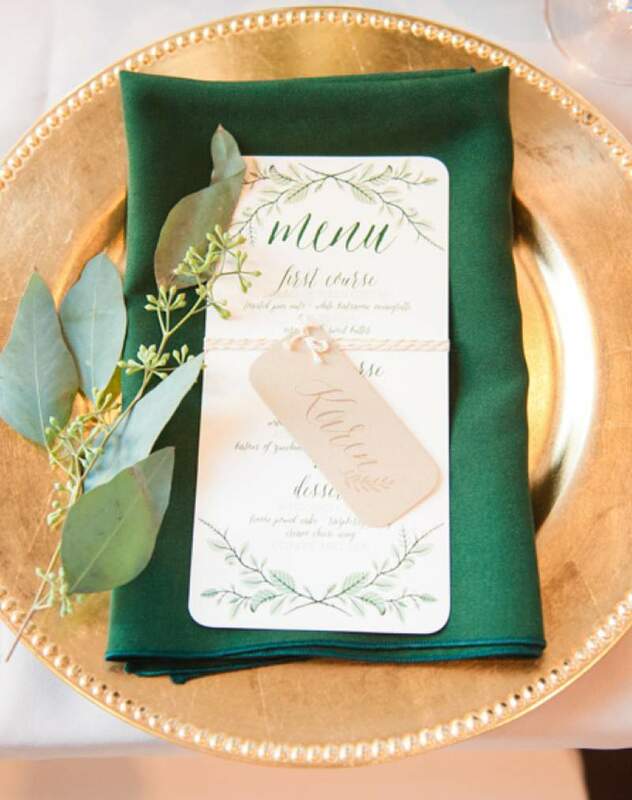 Their new shop is a stationery lover’s dream, complete with beautiful cards and thank you notes, journals, gift wrap and more—but luckily, there’s oodles for wedding-planning couples to peruse, too: customizable place cards, table numbers, cards and more. You’ll also find stunning art prints (we love the Rifle Paper Co. city illustrations) that make for lovely gifts when popped into a pretty frame. So whether you need some adorable boxed notecards for sending out your thanks after your shower or some cute little goodies for your girls, we suggest you make a pit stop here to scoop up TPD’s new treats. The shop is open 10-6, Monday through Friday and from 10-5 on Saturdays—and the studio is right upstairs, where anyone is welcome to come take a peek at all the fun stuff they have going on. Happy shopping! 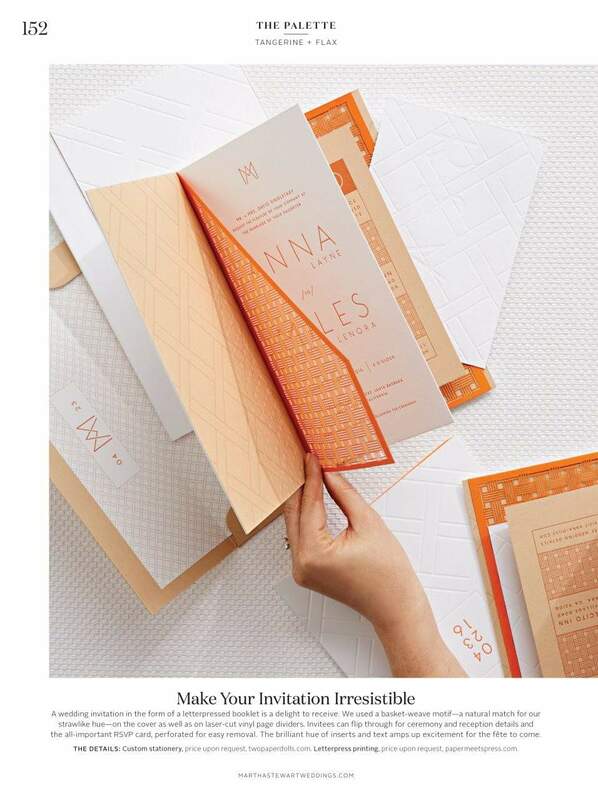 When you’re putting together a wedding day that’s a perfect reflection of you and your to-be, the last thing you want to do is send out cookie-cutter invitations to all your nearest and dearest. 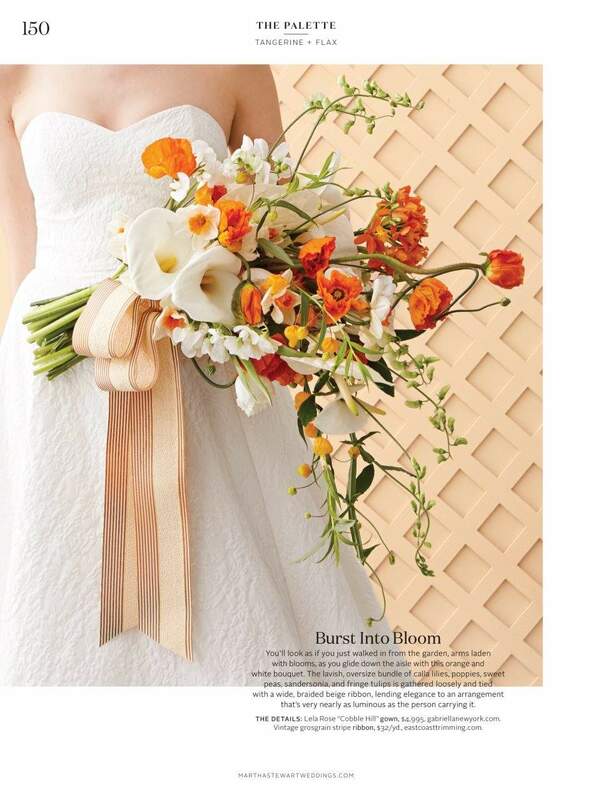 Luckily, the Philadelphia area is home to several custom invitation studios helmed by talented designers who can take your vision for your wedding day and literally put it down on paper. 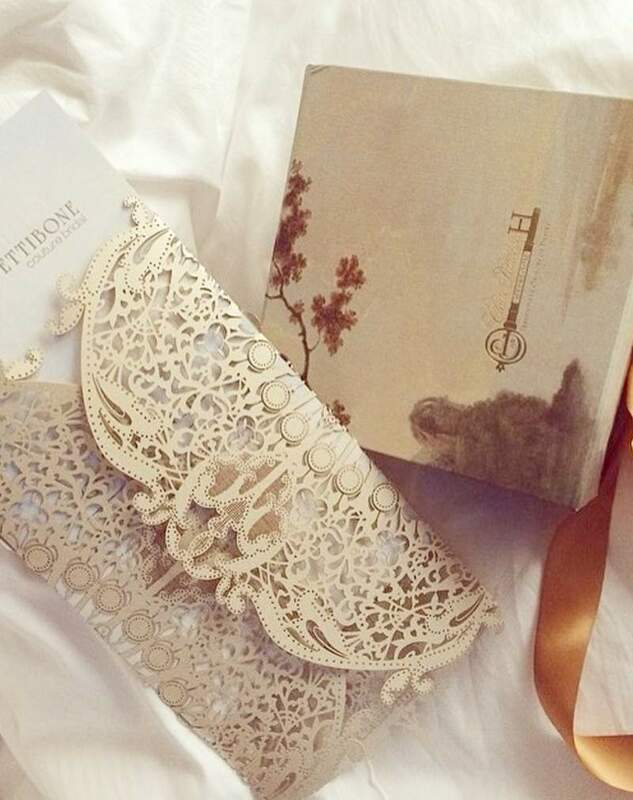 After all, your invitations are the first glimpse your guests have of what’s in store for them on your Big Day—you want to make sure they see nothing but the best. 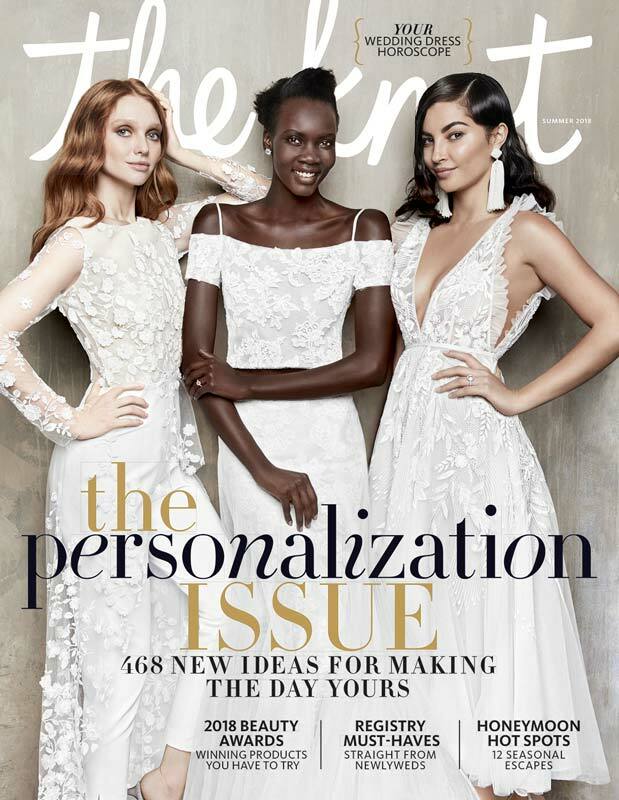 These exquisite programs enchanted guests at Claire Pettibone’s Bridal Fashion Week runway presentation and introduced us to Two Paperdolls. Laser-cut paper lace complemented the intricately embellished gowns of Pettibone’s Gothic Angels collection. 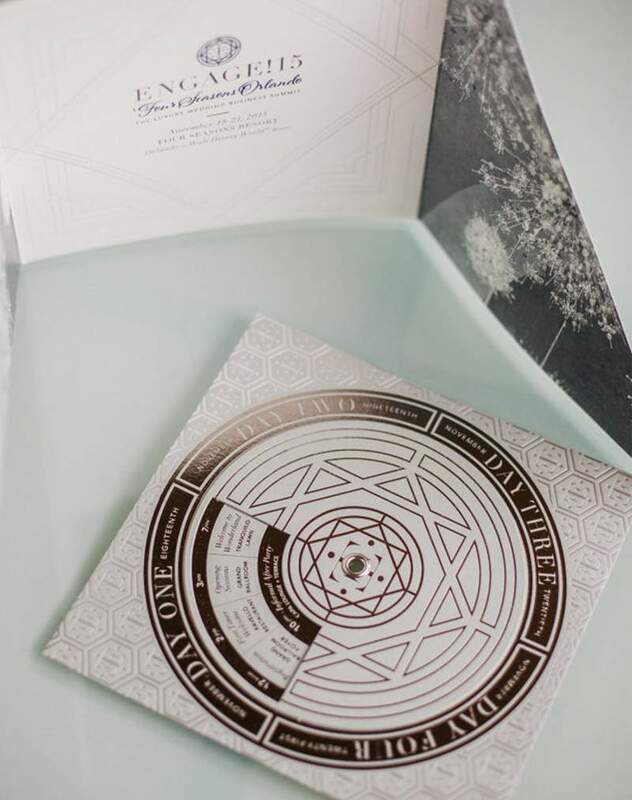 Soon after the show, we swooned over the studio’s portfolio of wedding invitations. 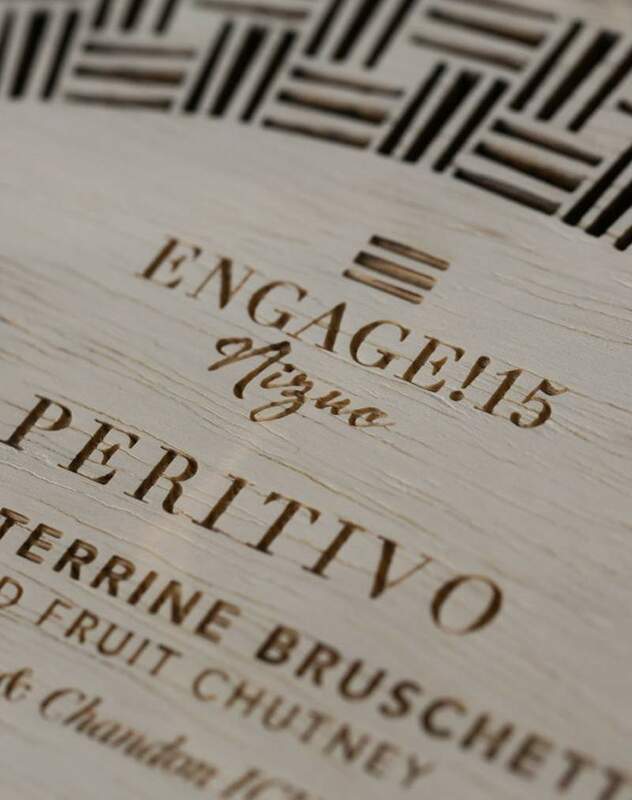 Luxury letterpress, created on antique printing presses, features custom graphics, intricate calligraphy and eye-catching detail. 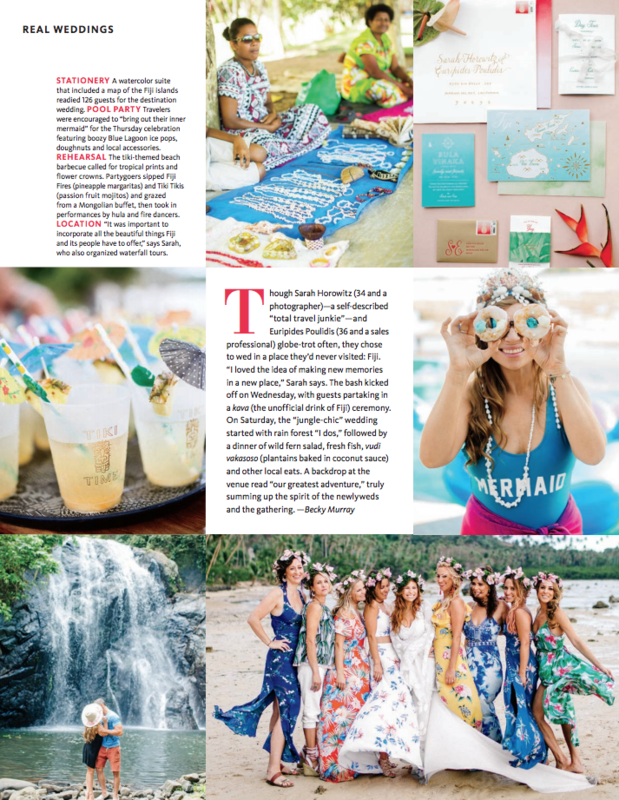 Hip hip hoorays are in order because not only have we been graced with the presence of a Terrain at Styer’s fête but the magic maker behind the camera is none other than Alison Conklin Photography. Amazing photographer + killer venue along with a melt-your-heart couple is a total win win in SMP land (actually in most lands I’m sure). 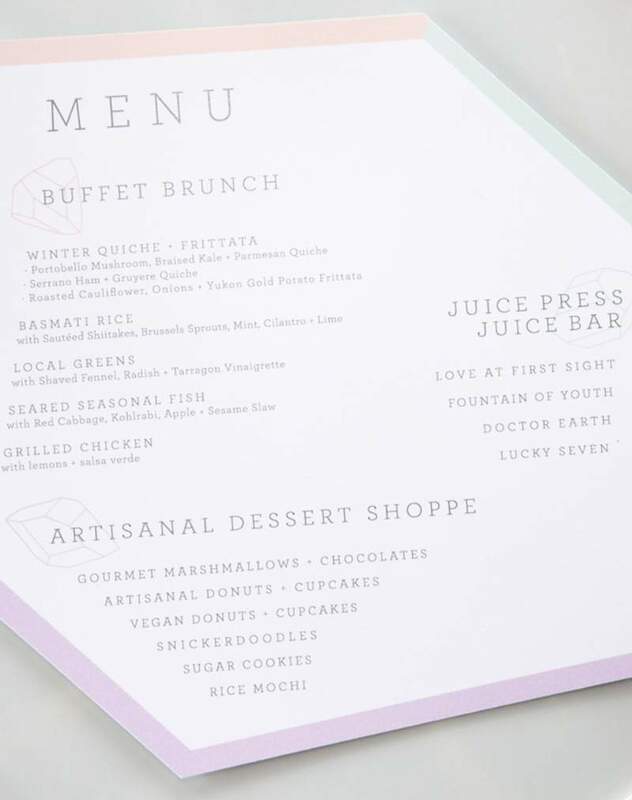 And we adore every single scrumptious last inch of this unique shindig. 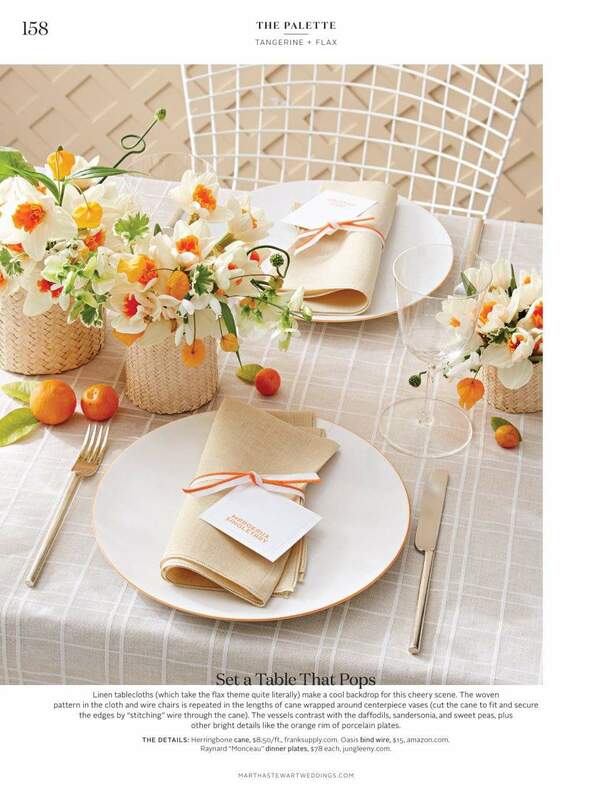 It’s the perfectly imperfect gardens, the homespun-esque decor, the lovely, intimate atmosphere. 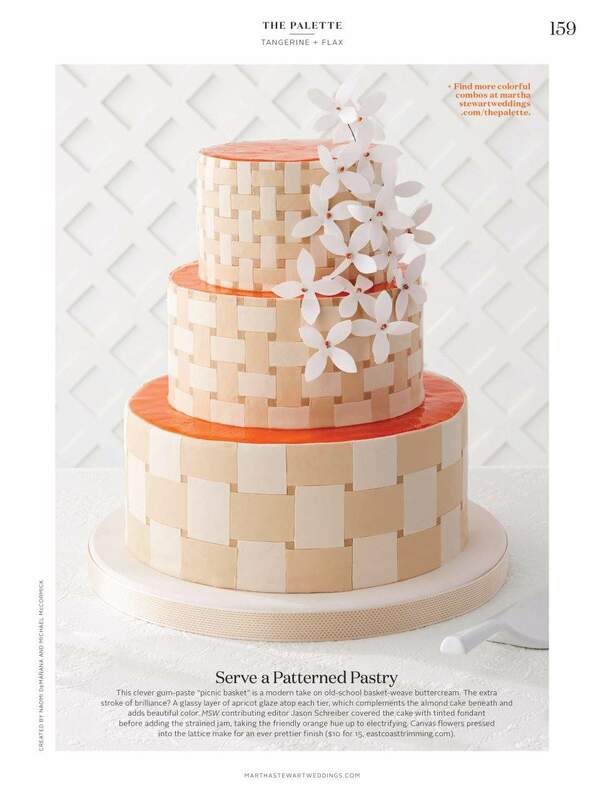 Oh if only we could set up house at Terrain. The next best thing? Spending some time devouring every photograph from this gorgeous wedding in the full gallery. When Vanessa Kreckel started Two Paperdolls, a custom invitation and stationery design firm in Wayne, she didn’t put a business plan together. She didn’t get money together. She went with her gut. All of Kreckel’s life, whenever she’s had a gut feeling, she’s gone with it, and launching the business in 2000 was one of them. “Certainly, there are struggles involved in things like that, but I feel like I put a lot of faith into everything I do and its just kind of always worked out,” Kreckel said. So, Kreckel took a leap of faith and left her full-time job as associate director of athletic communications and director of publications at the University of Pennsylvania. 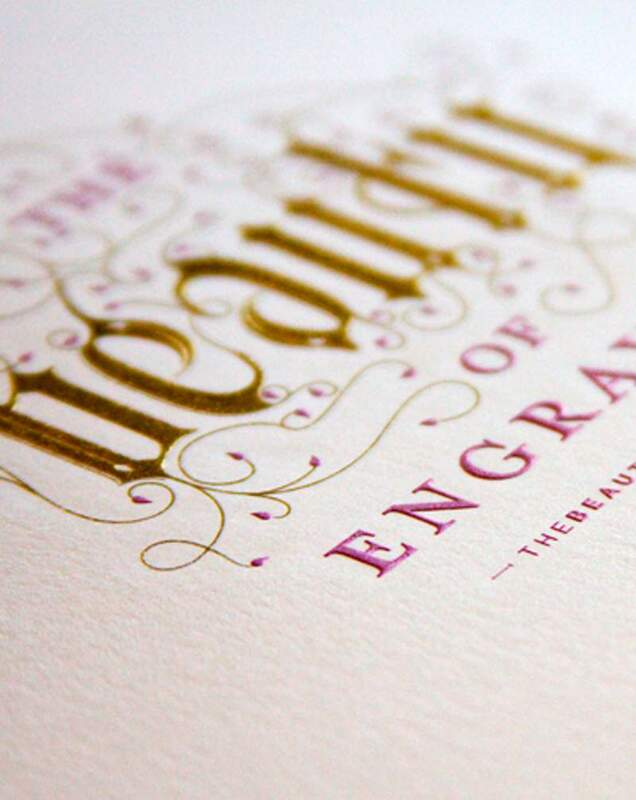 Now, 10 years later, Kreckel’s once one-person operation is a full-service design firm with an in-house letterpress printing factory, a dozen employees and two sister companies. 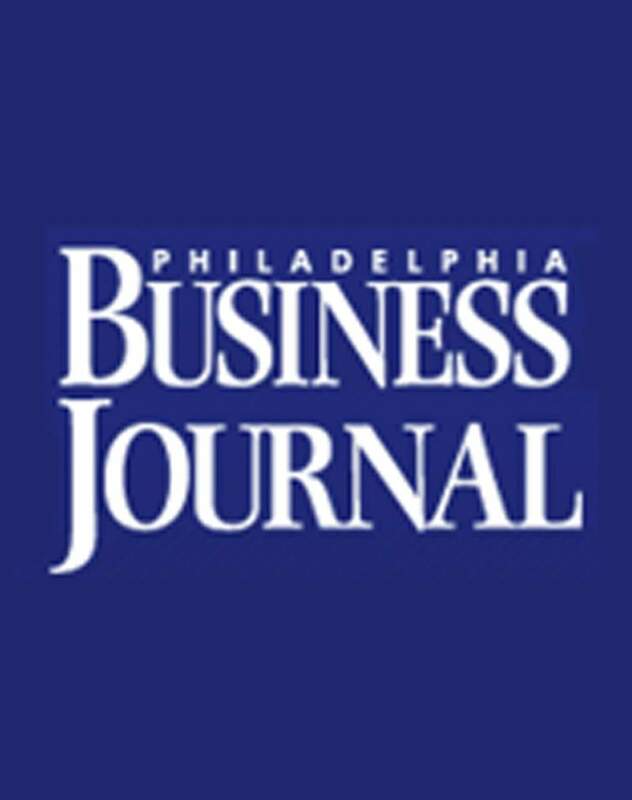 Comcast Corp., Land Rover Jaguar Main Line and the Philadelphia Eagles are among the firm’s many business and individual clients. In starting Two Paperdolls, Kreckel had two things working in her favor. 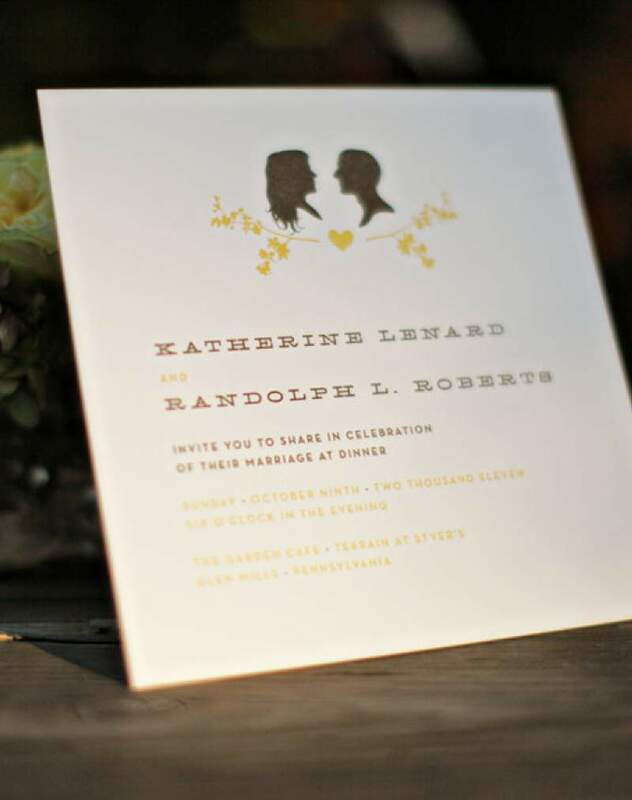 The first was there was already buzz about her creative designs in the Main Line area because of invitations she had been doing on the side for friends and family while working at Penn. The second was her post at Penn and an earlier job at Alvernia University in Reading helped her get her feet wet in design and build relationships that she was able to tap later as an entrepreneur. At Alvernia, Kreckel coached field hockey and lacrosse and served as the sports information director, a job that included the task of designing all of the school’s media guides and other materials, she said. “I really honestly taught myself everything I knew about Photoshop, [Adobe] Illustrator, all of that,” said Kreckel, who majored in communications with a minor in computer science at Cedar Crest College. 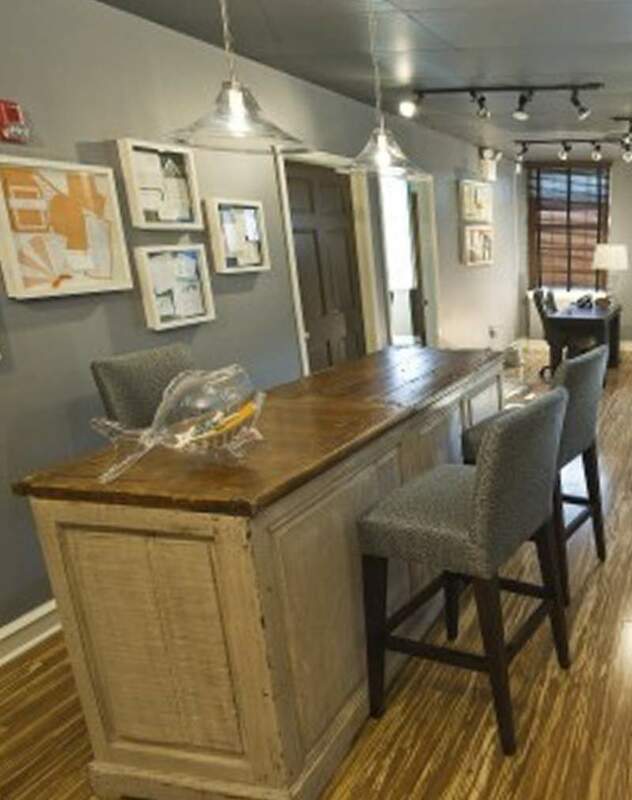 To get her business off of the ground Kreckel secured office space in Wayne, giving up the dining room table in her home where she had spent so many nights and weekends designing and putting together invitations for friends and family. 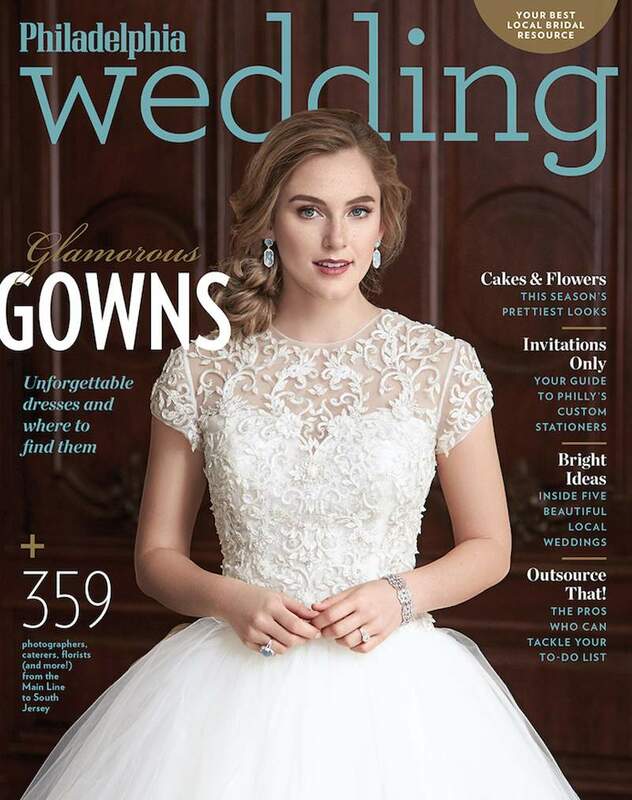 Once there, business grew largely by word-of-mouth and people coming into contact with her work, which today runs the gamut from everything from custom wedding invitations, stationery and business cards to logo and Web site design. “When you are doing 100 or 200 invitations at a time and they are getting mailed out to people and people are freaking out [saying] where did you get this, that really helped build our reputation quite well over time and still does,” Kreckel said. Business grew at a steady clip, bringing with it the need for more staff and more space, said Kreckel, who in 2007 acquired two letterpress machines enabling the firm to do their own printing in-house. After expanding operations into multiple nearby properties, Kreckel acquired, renovated and moved into a 6,000-square foot building at 55 West Avenue in Wayne last year big enough to hold everything. 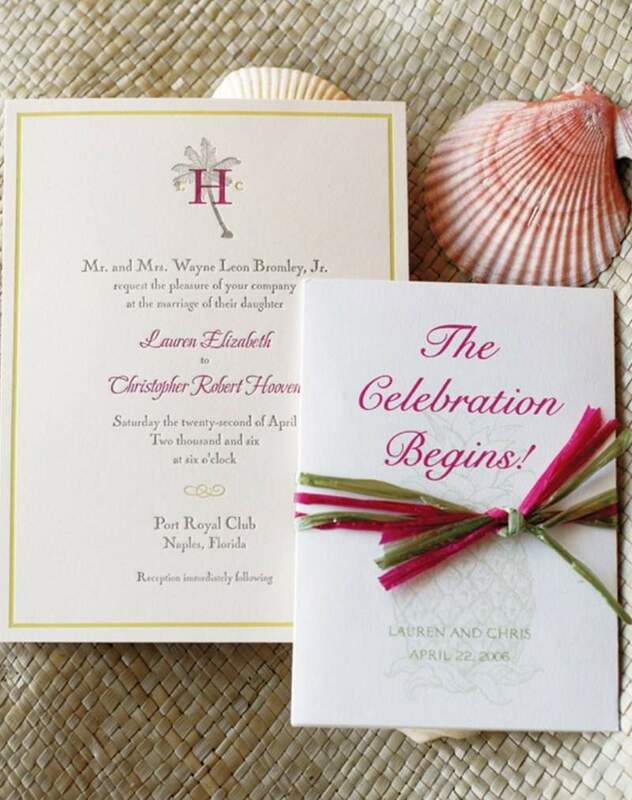 Formed in 2006, Louella Press, a line of letterpress note cards and stationery and an engraved wedding album is carried in roughly 250 stores across the country, Canada and Europe. 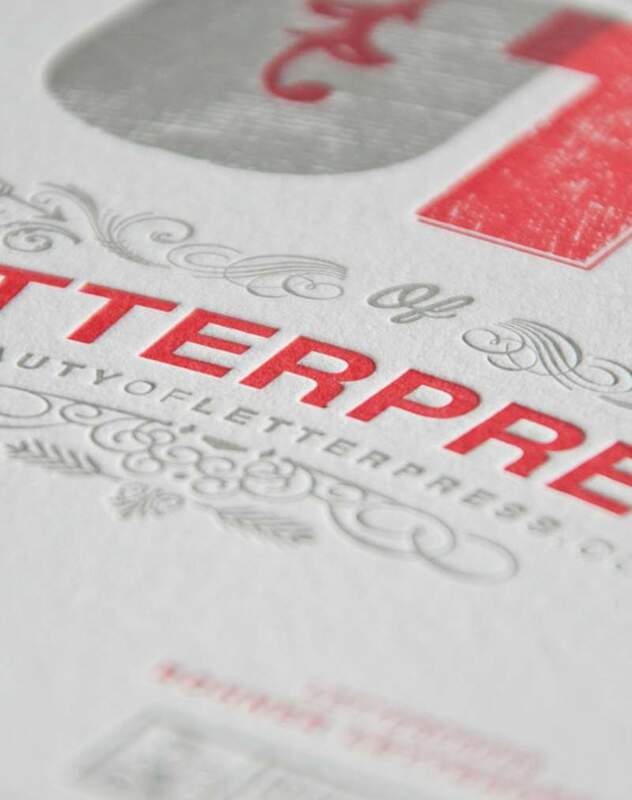 Pressed 55, a letterpress design store located in Northern Liberties, was established in 2009, Kreckel said. But, success hasn’t been without its bumps, said Kreckel. Like many businesses, her company has struggled in the economic downturn. Kreckel has made it through with the help of a mentor, creative marketing to reach new clients and by ramping up Web-site design services. This year, Kreckel plans to push the branding and identify side of her business, which includes logo design. Best Business Decision: Bringing somebody else in and entrusting them with financials and confidential information. Advice to Other Young Entrepreneurs: No matter what, money, financial stuff aside, if you have a plan and you have a dream and you believe enough in it, it will work. Yardstick for success: I don’t think there’s anything that gives me more satisfaction than the happy client. … If you don’t have passion for something forget it, that’s true for everything in life. From the moment she first walked into his classroom, Chris Hooven knew that Lauren Bromley would always be an important part of his life. But they were only in high school at the time, and Lauren was also Chris’ sister’s best friend, so it seemed only right to get to know one another as friends. 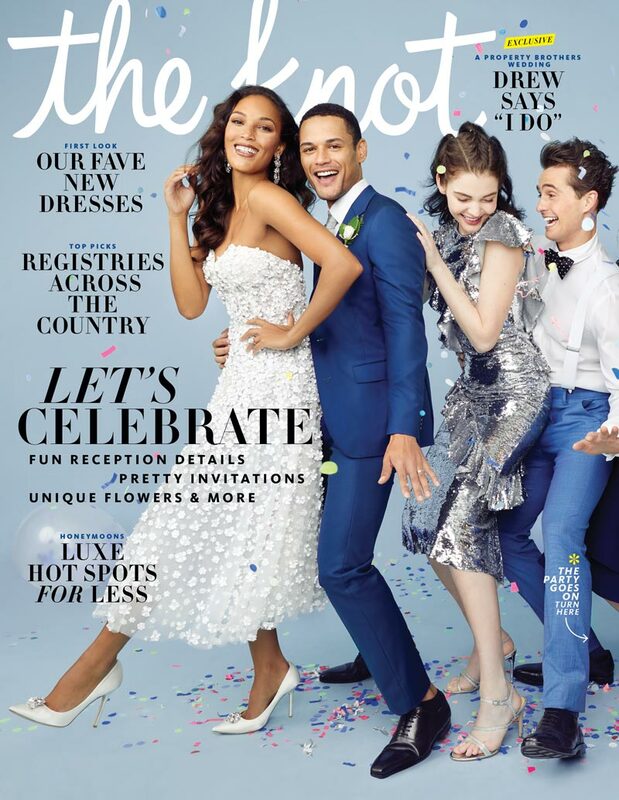 Slowly, the two fell in love over many summers spent together on Long Beach Island, a popular spot on the New Jersey shoreline, until they reached college, when the timing felt perfect for something more. 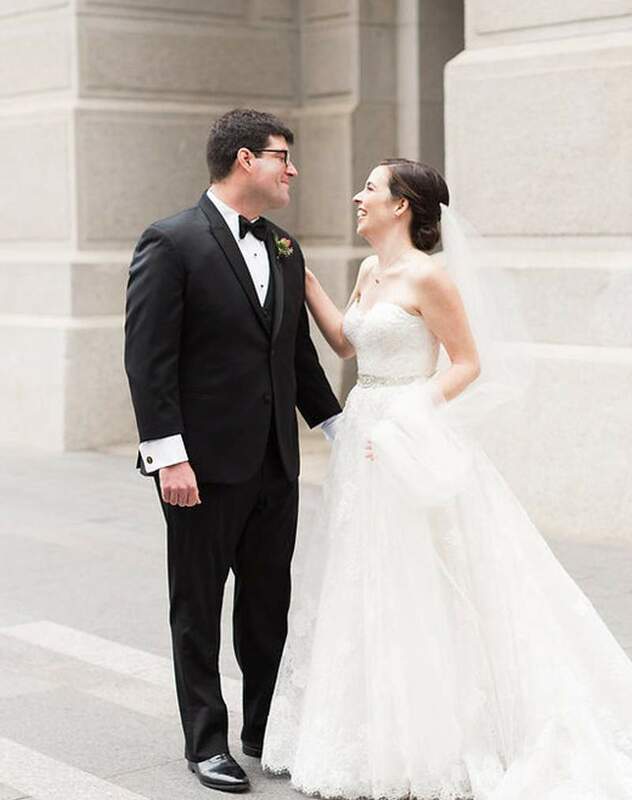 A few years later, with a romance in full bloom, Chris surprised Lauren with a proposal in her Philadelphia apartment. While in the midst of cooking her dinner, Chris asked Lauren to grab a bottle of wine from the refrigerator, and inside Lauren found the box holding her engagement ring. 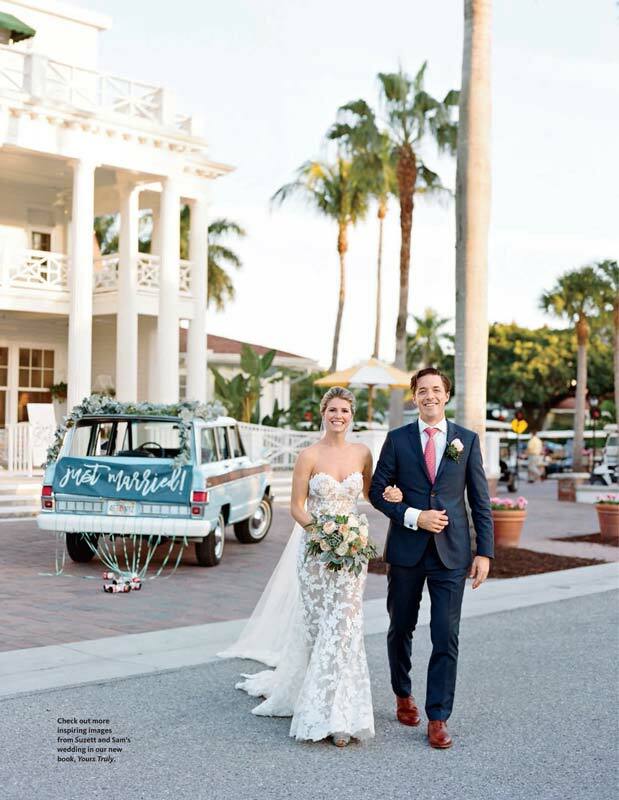 Naturally, Lauren and Chris wanted to celebrate their wedding at the beach and loved the idea of giving their guests a reason to turn the wedding weekend into a mini-vacation. 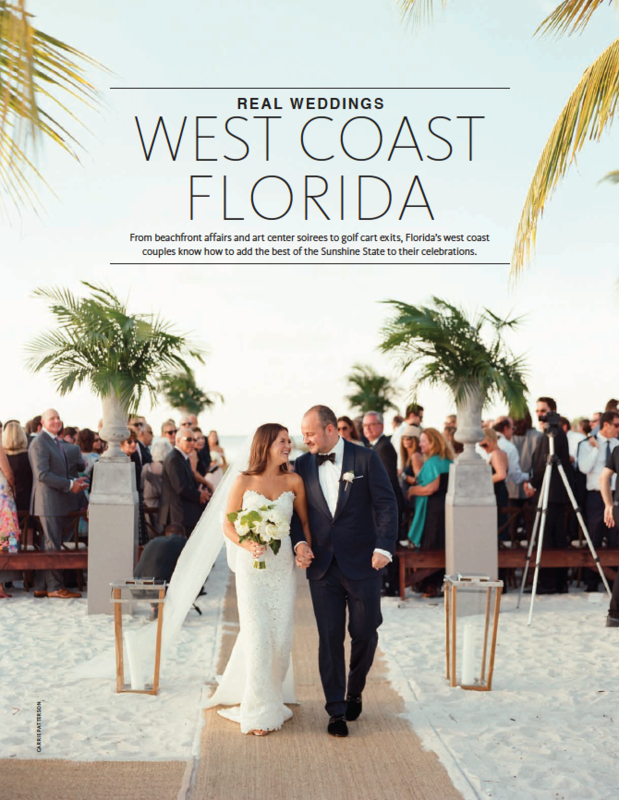 The bride and groom decided to hold the festivities at the Port Royal Club in Naples, Florida, where Lauren’s parents are members and where their guests could really indulge in a warm weather getaway. 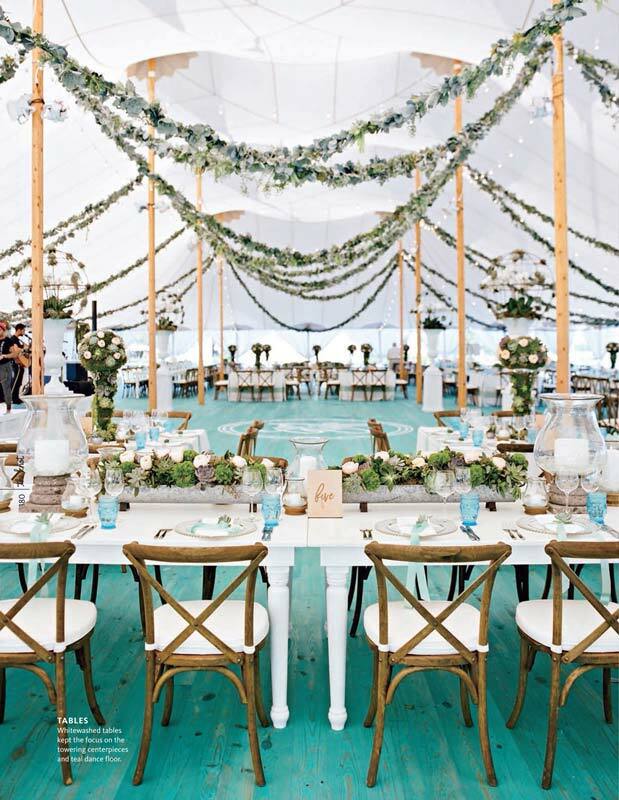 With most of their guests traveling from the Philadelphia area, the couple pulled out all the stops and treated them to a weekend of pure fun in the sun. 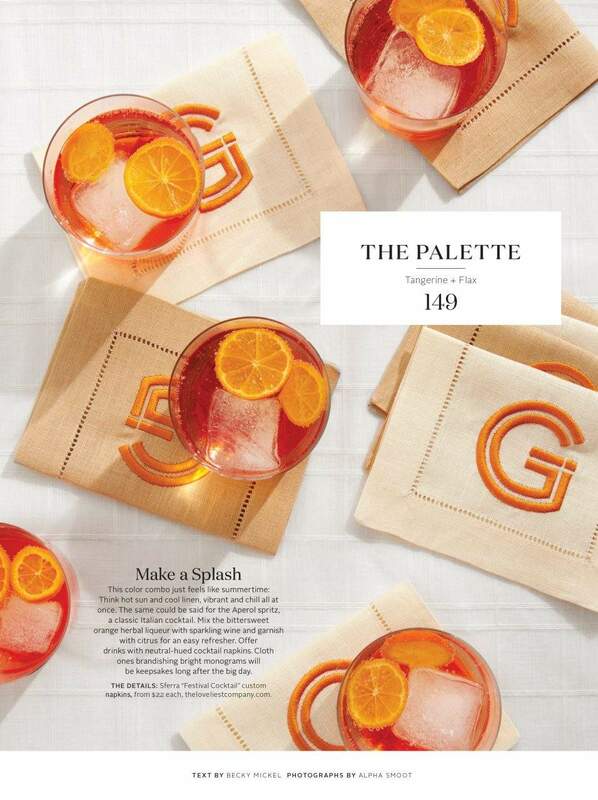 From the moment guests arrived to find their hotel rooms stocked with goodies in woven welcome bags to the final Bloody Mary they enjoyed at the post-wedding brunch, each of Lauren and Chris’ lucky loved ones felt like they, too, were the center of attention. 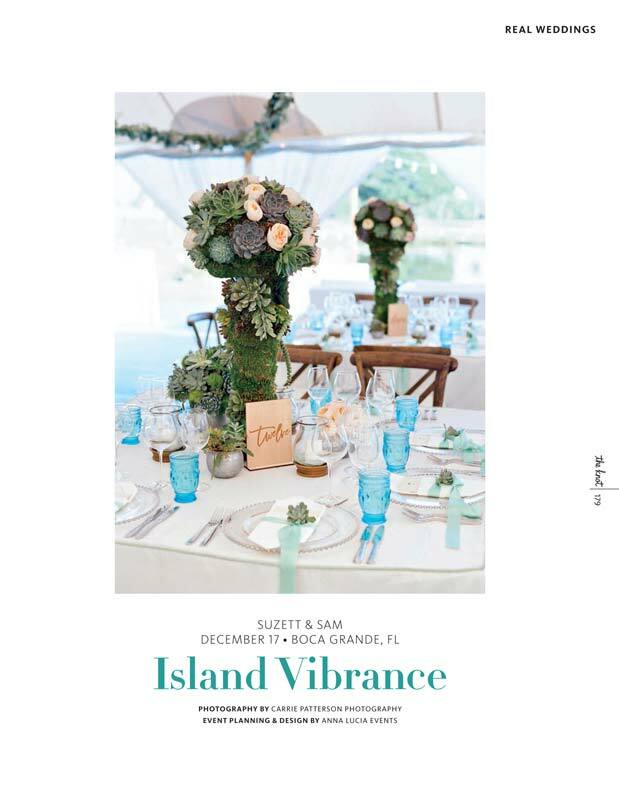 The décor for the wedding was created around a central color palette – raspberry, key lime, and white – as well as a unifying palm tree and monogram motif, which adorned everything from the savethe- dates to the custom labels found on souvenir bottles of water and sunscreen. 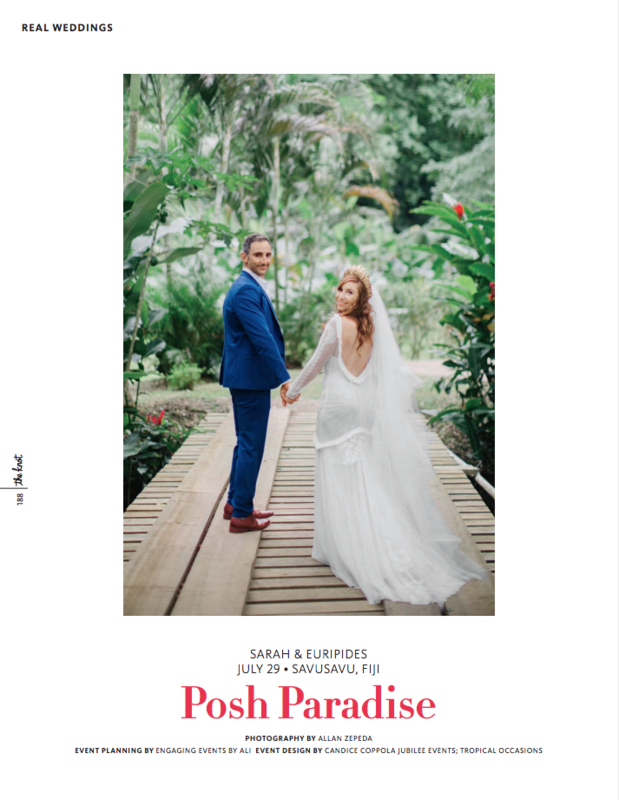 The vibrant tones and palm tree symbol reflected the tropical setting and the carefree mood the couple succeeded in creating for their celebration. With the help of their families, especially Lauren’s “incredibly organized” mother (“I think she even read more bridal magazines than me!”), and coordinator Milda Vaivada, Lauren and Chris painstakingly designed each detail to express their personalities as well as the strong desire they had to give everyone an unforgettable experience. 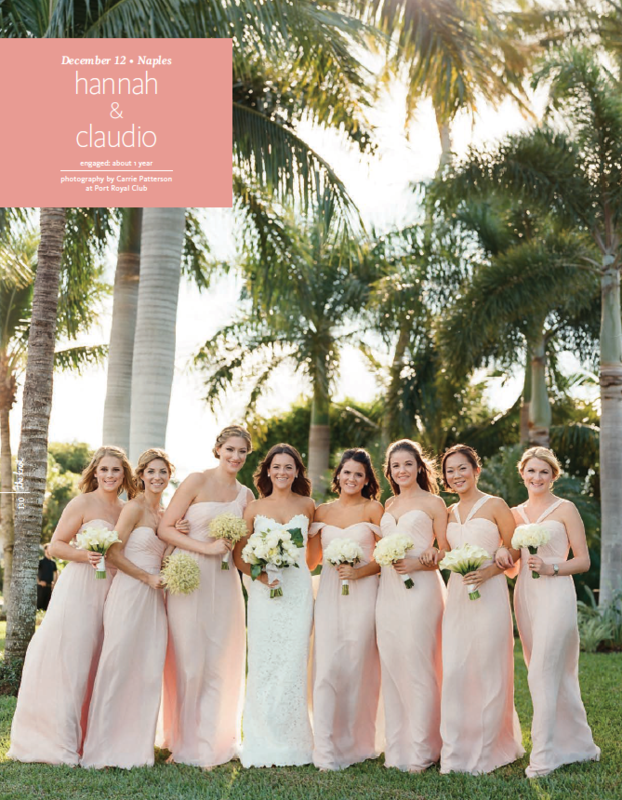 Flanked by seven bridesmaids in custom-made dresses and an equal number of groomsmen wearing coordinating ties, Lauren and Chris stood beneath a double archway of bowing palm branches to exchange vows. They also participated in a personalized “sand ceremony” designed to unite the two stages of their relationship. In one glass urn, sand from Long Beach Island symbolized their meaningful courtship, while sand in another urn from the beach in Naples symbolized their marriage. Together, Lauren and Chris poured both contents into a third vessel, inextricably mingling the grains. As guests arrived at the outdoor cocktail hour they were greeted with the choice of two signature cocktails: a passion fruit-pink Laurentini or a citrus green Christini. Both drinks were perfect pairings with the impressive variety of seafood – shellfish spilling from a wooden boat, sushi rolls made-to-order, and ceviche served in iced cocktail glasses – that was as pleasing to the eye as it was to the palate. 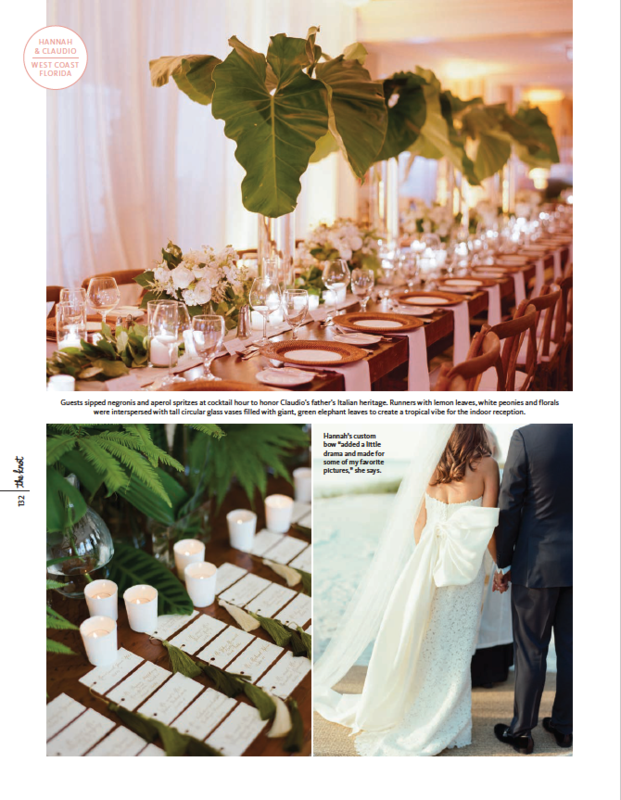 Lauren and Chris spent a lot of time designing their menu (they also threw a Cuban-inspired rehearsal dinner and an all- American Sunday brunch) as a wonderful mix of exotic tastes and familiar favorites. 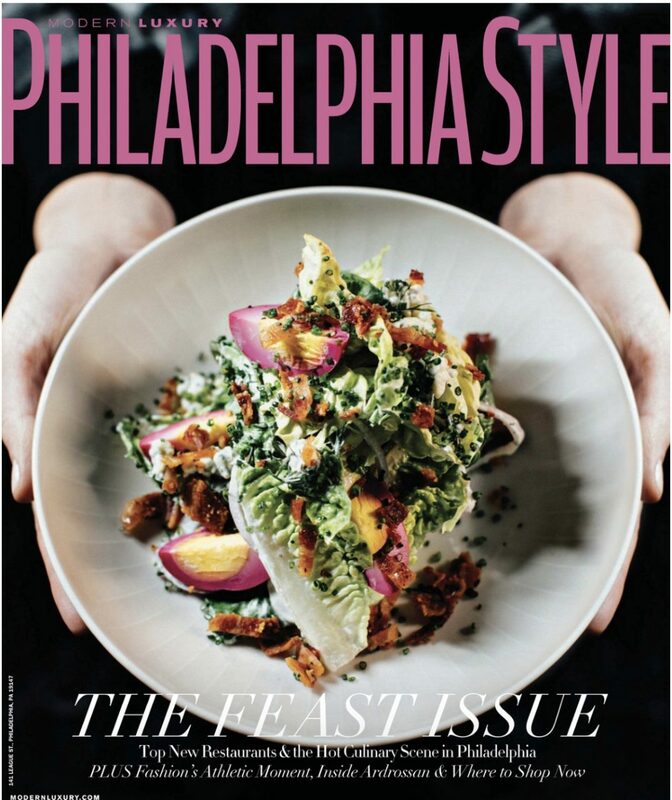 Even the parents of the bride got in on the culinary act and surprised the newlyweds with an after party complete with milkshake shooters and miniature Philly cheesesteak sandwiches––tasty tributes to their hometown. 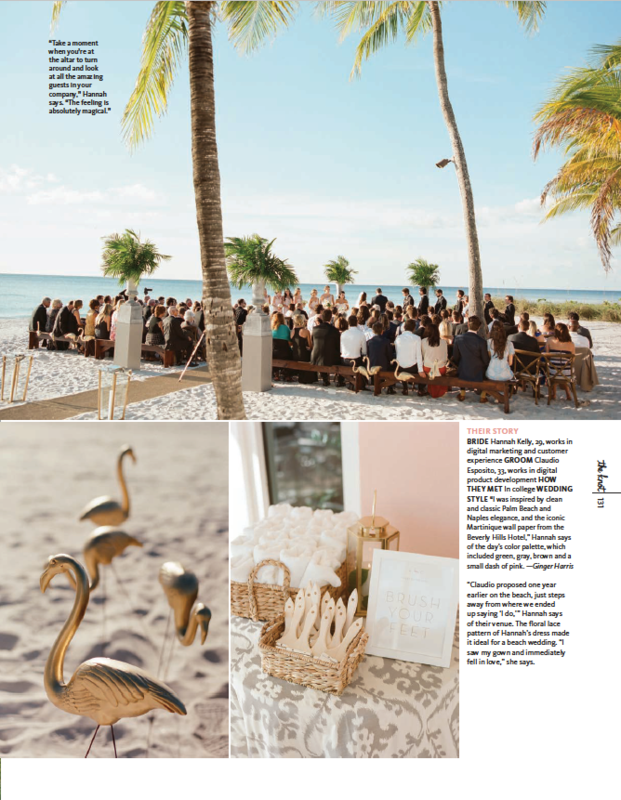 Inside the reception, guests found their seats with the help of place cards attached to tiny shells and table numbers tied to starfish and set in sand. 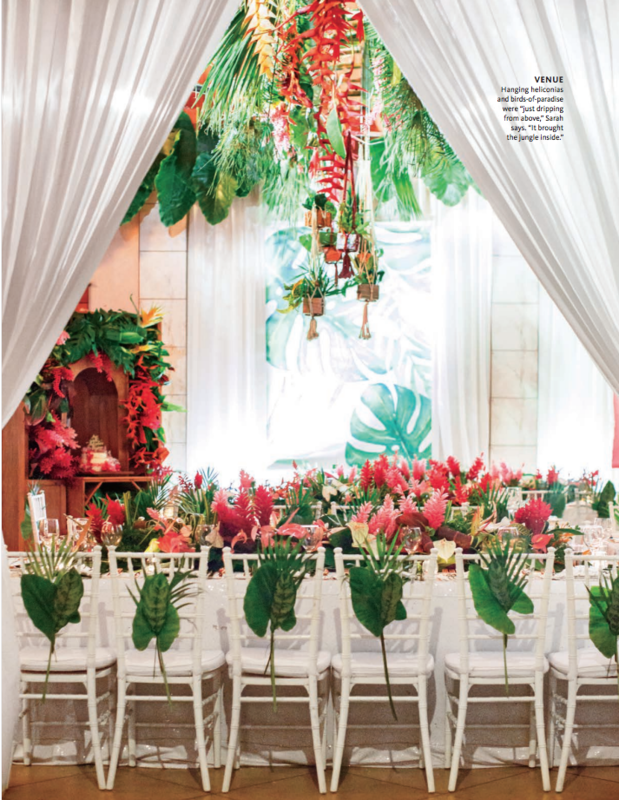 The tables, both round and rectangular, were draped in raspberry linens and topped with alternating centerpieces of pink and green flowers – hydrangea, cymbidium orchids, roses, and spider mums – in contemporary arrangements. Some of the arrangements were displayed in candelabra made from twisted branches while others supported clear boxes filled with votive candles. All in all, the décor created an inviting glow throughout the room for the dancing and toasting that filled the evening. 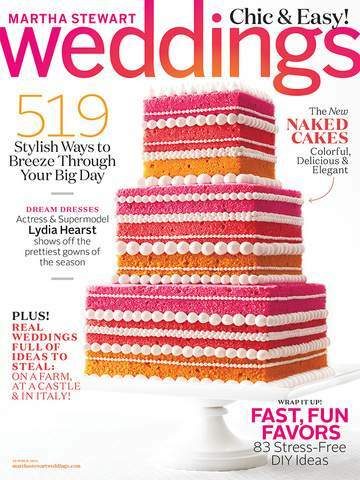 No detail was overlooked, not even the dessert service, which, in addition to a buffet of sweets complete with a fondue fountain, included delicately plated slices of the couple’s beach-themed cake. 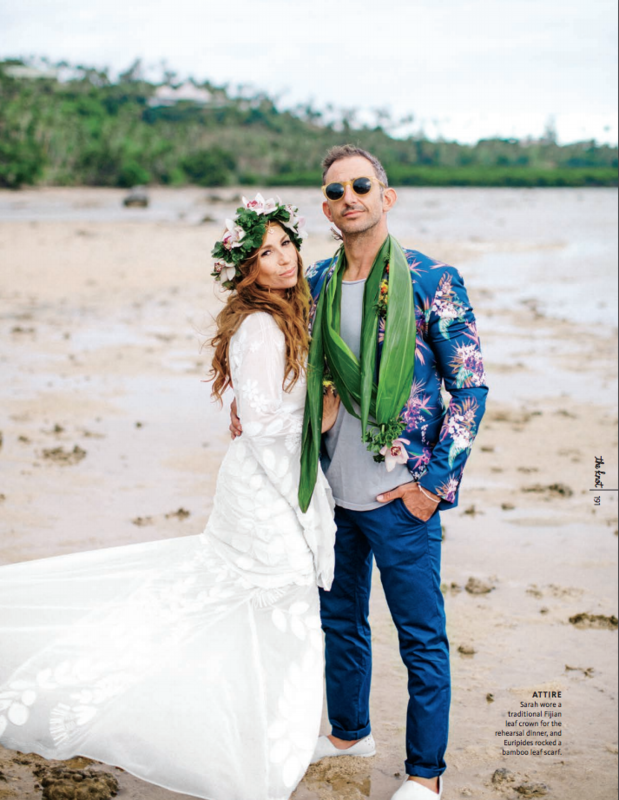 But even when the last piece was enjoyed and the final guest bid the weekend farewell, Lauren and Chris’ tropical paradise was not over: they spent their honeymoon in Anguilla, with glasses of their favorite rum punch in their hands and sand between their toes.